Bonding is an alternative to veneers provided by Dr. James Holt. This advanced technique can be used to restore chipped, cracked, discolored, small, or misaligned teeth, helping you get a beautiful natural smile. Dr. Holt carefully preps the tooth for the composite material by lightly etching the surface of the tooth and applying a bonding agent. 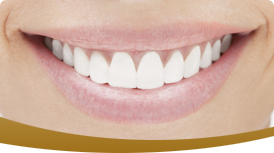 The composite resin is then carefully applied and sculpted into your natural tooth shape, smoothed, and polished to give you a brand new gorgeous smile! Bonding is more likely to stain than your natural teeth and it can chip more easily. It is not as strong as porcelain veneers and typically last for three to five years. Dental bonding is a less expensive procedure than veneers, and could be just the right restoration for you! Dr. Holt is an expert at making dental bonding appear natural and beautiful. Please call us at 817-488-2273 if you would like to have a free consultation about dental bonding.